I find understanding a Burnley fan playing for Blackburn Rovers somewhat difficult but that's what Colne born Kevin Hird did in the early seventies after being spotted by the scouts of our local rivals. After a successful apprenticeship he earned himself a professional contract in the summer of 1973 at a time when we were heading back to the First Division a position two divisions above Blackburn. By the end of that season Hird had made his league bow against Watford and played occasionally in the following season as they won promotion. He'd started in midfield but at this time he was shifted to right back and he was part of the side that fleetingly threatened to go back up to the top flight before falling back down and suffering relegation again in 1979. Just before that relegation he was sold to Leeds United for £375,000 and became the most expensive full back in English football. There were some familiar faces from the club he supported. The manager who signed him was Jimmy Adamson whilst on the playing staff at Leeds then were Brian Flynn and Ray Hankin, both signed from Burnley. He spent over five years at Elland Road where he was nicknamed 'Jasper' and although he was often inconsistent he was a popular player with the crowd because of his 100% commitment in every game. He featured in UEFA Cup ties for Leeds during his first season but also suffered relegation out of the top flight at the end of the 1981/82 season which coincided with Burnley winning the 3rd division. That meant he played against us for the first time in the following season and at Elland Road he scored their last goal in a 3-1 win for Leeds with a stunning strike. It is bad enough conceding a goal, but to an ex-Blackburn player!!! 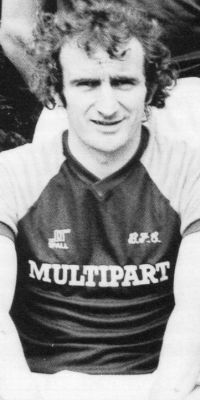 He lost his regular place in the 1983/84 season although it was still something of a surprise when they allowed him to join the club he supported on a free transfer. Still just 29-years-old this was a coup for then Burnley manager John Bond and Hird proved to be one of this particular manager's last signings. It wasn't the right time to join the club as it was just about to enter its darkest period. Under John Benson, following the departure of Bond six days before the beginning of the season, he was one of the shining lights in the most miserable of seasons that saw us relegated to the 4th division. He played in the midfield but contributed no fewer than 23 goals, with 14 of them coming in the league. He scored two hat tricks. The first came away from home in the FA Cup at Penrith. Alan Taylor also netted three that day and only three players have since scored hat tricks away for the Clarets - Graham Lancashire, Paul Barnes and Ade Akinbiyi. His second, in a 7-0 hammering of Rotherham in February 1975, was the last Burnley hat trick for over six and a half years. With Burnley in the basement division for the first time in the 1985/86 season much of our hope fell on players such as Hird to get us straight back up again. Although a regular he couldn't find anything like the same number of goals as in the previous season and we never seriously threatened a promotion. It all brought his Burnley career to an end after two years. With the club in such a financial mess they just couldn't afford to keep him. As a sign of the times around then he joined a club that could afford him, his home town club Colne Dynamoes. He never returned to league football and ended his days with the Colne side but continued to involve himself in football running soccer schools for local children in the Pendle area for many years afterwards. I still don't quite understand how a Claret can pull on that blue and white halved shirt, but Kevin Hird more than made up for it when he finally pulled on the claret and blue of Burnley. He was just very unfortunate that his two years at Turf Moor came at such a difficult time for Burnley Football Club.